Micarta handle hunting knives for sale. Great prices on micarta handle hunting knives, fixed blades or folding hunter knives. Overall: 9"; Blade: 4.375" | A2 Tool Steel | Standard Edge; Handle: Black | Micarta; Other Info: Full Tang | Lanyard Hole. Contoured canvas handles. Nickel silver finger guard. Embossed brown leather belt sheath. Boxed. Made in the USA. Overall: 9.75"; Blade: 4.5" - S30V Stainless - Standard Edge - Black Finish; Handle: Black - Micarta; Other Info: Thumb Ridge - Full Tang. Glass breaker. Black Kydex belt sheath. Boxed. Made in the USA. Overall: 11.75"; Blade: 6.5" - S30V Stainless - Standard Edge - Black Finish; Handle: Black - Micarta; Other Info: Thumb Ridge. Glass breaker. Black Kydex belt sheath. Boxed. Made in the USA. 7 3/4" overall. 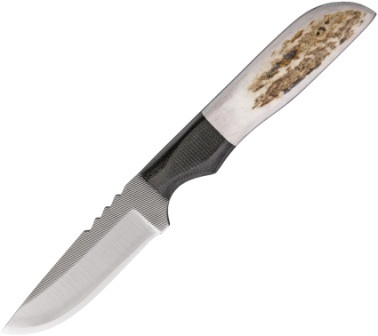 4" skinner blade with decorative file work. Made from a file which has been annealed, cold ground and polished. Full tang. Black canvas micarta handles. Black leather belt sheath. Bulk packed. Made in the USA. 6" overall. 2 1/2" blade made from files which have been annealed, cold ground and polished. Full tang. Black canvas micarta handles. Lanyard hole. Brown leather belt sheath. Bulk packed. Made in the USA. 8 3/4" overall. 4 3/4" blade made from files which have been annealed, cold ground and polished. Full tang. Black canvas micarta handles. Brown leather belt sheath. Bulk packed. Made in the USA. 8 7/8" overall. 4" blade. Rough black micarta grips. Lanyard loop. Entire knife has blued finish. Handmade leather sheath. Designed by C. T. Boddington. Handmade in the USA. Overall: 5"; Blade: 2.25" | Standard Edge; Handle: Micarta; Other Info: Full Tang. Black canvas handles. Black leather belt sheath with lanyard. Bulk packed. Made in the USA. 12 3/4" overall. 7 3/4" blade. Black micarta handles. Full tang. Lanyard hole. Black leather belt sheath. Made in the USA. 11 1/8" overall. 6 1/8" blued high carbon steel drop point blade with false top edge and partial fileworked spine. Full tang. Black micarta handles with finger choil. Knife is made from a 14" file, .200" thick. Lanyard hole. Embossed black leather belt sheath. Made in the USA. 5 3/8" overall. 2 1/4" skinner blade made from a file which has been annealed, cold ground and polished. Full tang. Green canvas micarta handles. Brown leather belt sheath. Bulk packed. (Note: Due to natural variances - handle colors may vary slightly from piece to piece.) Made in the USA. 7 1/8" overall. 3 1/2" blade made from files which have been annealed, cold ground and polished. Full tang. Black canvas micarta handles. Brown leather belt sheath. Bulk packed. Made in the USA. 7 3/4" overall. 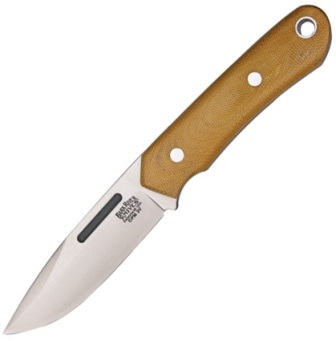 3 3/4" clip point blade made from a file which has been annealed, cold ground and polished. Full tang. Black canvas micarta handles. Brown leather belt sheath. Bulk packed. Made in the USA. 7 1/4" overall. 3 1/4" skinner blade made from a file which has been annealed, cold ground and polished. Full tang. Black canvas micarta handles. Brown leather belt sheath. Bulk packed. Made in the USA. 8" overall. 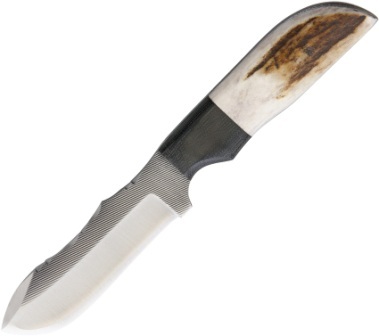 4" skinner blade made from a file which has been annealed, cold ground and polished. Full tang. Black canvas micarta handles. Brown leather belt sheath. Bulk packed. Made in the USA. 5" overall. 2" blade made from a file which has been annealed, cold ground and polished. Full tang. Black canvas micarta handles. Brown leather belt sheath. Bulk packed. (Note: Due to natural variances - handle colors may vary slightly from piece to piece.) Made in the USA. 8" overall. 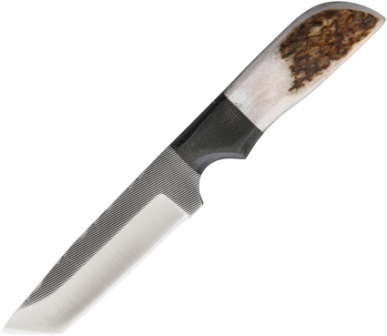 4" skinner blade with decorative file work. Made from a file which has been annealed, cold ground and polished. Full tang. Black canvas micarta handles. Brown leather belt sheath. Bulk packed. Made in the USA. Elk Handles with Black Micarta Bolster. 9" overall. 4.75" blade. Elk stag handle. Micarta bolster(s). Full tang. Brown leather belt sheath. Bulk packed. Made in the USA. 8 3/4" overall. 4 3/4" blade made from a file which has been annealed, cold ground and polished. Full tang. Black canvas micarta handles. Brown leather belt sheath. Bulk packed. Made in the USA. 6 1/4" overall. 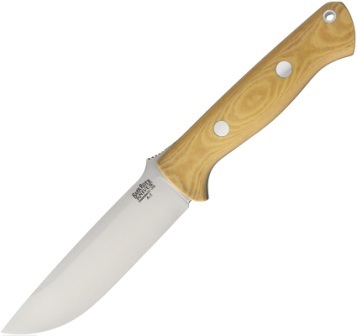 2 3/4" blade made from a file which has been annealed, cold ground and polished. Full tang. Black canvas micarta handles. Black leather belt sheath. Bulk packed. Made in the USA. Fixed Blade. 6.63" overall. 3" blade. 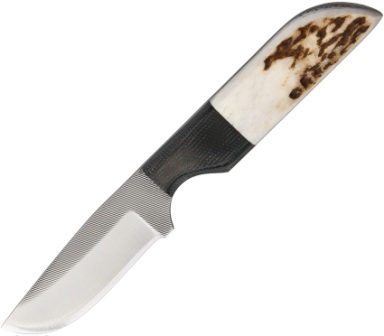 Elk stag handle. Micarta bolster(s). Full tang. Brown leather belt sheath. Made in the USA. 6 3/4" overall. 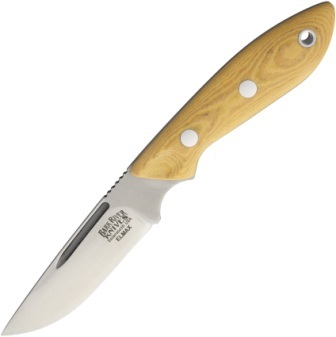 2 3/4" drop point blade made from a file which has been annealed, cold ground and polished. Full tang. 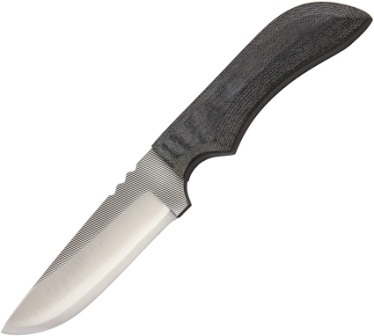 Black canvas micarta handles with Dymond wood inlay. Brown leather belt sheath. Bulk packed. (Note: Due to natural variances - handle colors may vary slightly from piece to piece.) Made in the USA. 7 1/8" overall. 3 1/4" skinner blade with decorative file work. Made from a file which has been annealed, cold ground and polished. Full tang. Black canvas micarta handles. Black leather belt sheath. Bulk packed. Made in the USA. 11 1/4" overall. 6 1/4" blade. Black micarta handles. Full tang. Lanyard hole. Black leather belt sheath. Made in the USA. 6 3/4" overall. 2 5/8" skinner blade made from a file which has been annealed, cold ground and polished. Full tang. Black canvas micarta handles. Brown leather belt sheath. Bulk packed. Made in the USA. 7 1/2" overall. 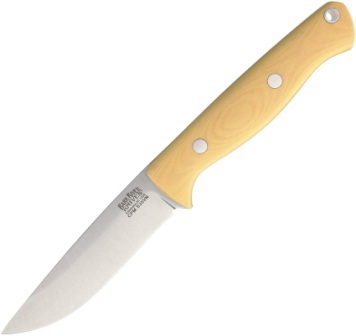 3 1/2" blade made from a file which has been annealed, cold ground and polished. Full tang. Black canvas micarta handles. Brown leather belt sheath. Bulk packed. (Note: Due to natural variances - handle colors may vary slightly from piece to piece.) Made in the USA. 7 1/2" overall. 3 1/4" blade made from files which have been annealed, cold ground and polished. Full tang. Black canvas micarta handles. Brown leather belt sheath. Bulk packed. Made in the USA. 9 3/8" overall. 4 5/8" blade. 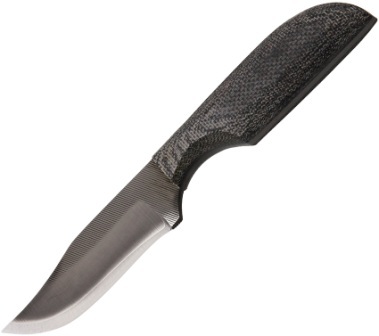 Black micarta handles. Full tang. Lanyard hole. Black leather belt sheath. Made in the USA. Fixed Blade. 9.5" overall. 4.375" blade. 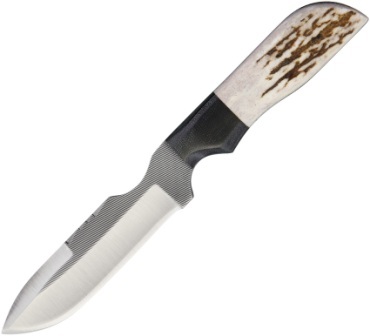 Elk stag handle. Micarta bolster(s). Full tang. Lanyard hole. Black leather belt sheath. Bulk packed. Made in the USA. 6 1/4" overall. 2 3/4" blade made from a file which has been annealed, cold ground and polished. Full tang. Green canvas micarta handles. Black leather belt sheath. Bulk packed. (Note: Due to natural variances - handle colors may vary slightly from piece to piece.) Made in the USA. 6 1/8" overall. 2 3/4" skinner blade made from a file which has been annealed, cold ground and polished. Full tang. Green canvas micarta handles. Black leather belt sheath. Bulk packed. (Note: Due to natural variances - handle colors may vary slightly from piece to piece.) Made in the USA. 6 1/8" overall. 2 3/4" Wharncliffe blade made from a file which has been annealed, cold ground and polished. Full tang. Green canvas micarta handles. Black leather belt sheath. Bulk packed. (Note: Due to natural variances - handle colors may vary slightly from piece to piece.) Made in the USA. 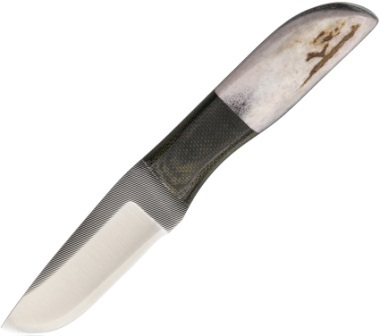 Elk Handles with Black Micarta Bolster. 6.38" overall. 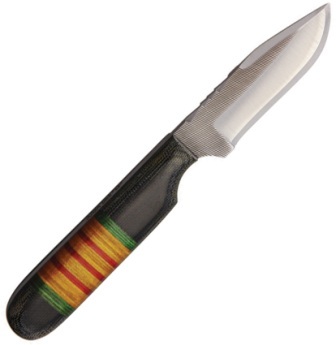 2.75" blade. 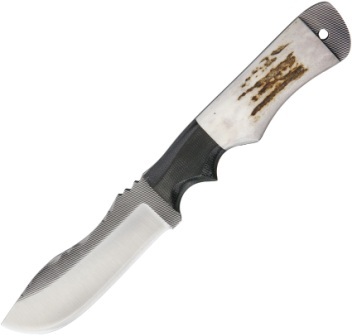 Elk stag handle. Micarta bolster(s). Full tang. Brown leather belt sheath. Bulk packed. Made in the USA. Overall: 6.375"; Blade: 2.75" | Standard Edge; Handle: Black; Other Info: Full Tang. Black canvas micarta handles. Brown leather belt sheath. Bulk packed. Blade made from files which have been annealed, cold ground and polished. Made in the USA. 7 1/8" overall. 3 1/4" A-2 tool steel blade. Full tang. Black canvas micarta handles. Lanyard hole. Brown leather belt sheath. Made in the USA. 7 1/8" overall. 3 1/4" A-2 tool steel blade. Full tang. Green canvas micarta handles. Lanyard hole. Brown leather belt sheath. Made in the USA. 7.25" overall. 3.25" satin finish CPM-3V carbon steel drop point blade. Black canvas micarta handle. Full tang. Lanyard hole. Brown leather belt sheath. Boxed. Made in the USA. 7.25" overall. 3.25" satin finish CPM-3V carbon steel drop point blade. Green canvas micarta handle. Full tang. Lanyard hole. Brown leather belt sheath. Boxed. Made in the USA. 7.25" overall. 3.25" satin finish CPM-3V carbon steel drop point blade. Natural canvas micarta handle. Full tang. Lanyard hole. Brown leather belt sheath. Boxed. Made in the USA. Overall: 8.375"; Blade: 4" | CPM 3V Stainless | Standard Edge | Satin Finish; Handle: Black; Other Info: Lanyard Hole. 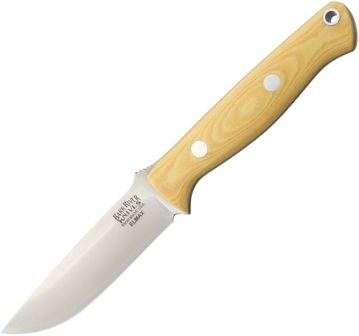 Drop point blade. Black canvas micarta handles. Full, extended tang. Brown leather belt sheath. Boxed. Made in the USA. Overall: 8.375"; Blade: 4" | CPM 3V Stainless | Standard Edge | Satin Finish; Handle: Green; Other Info: Lanyard Hole. Drop point blade. Green canvas micarta handles. Full, extended tang. Brown leather belt sheath. Boxed. Made in the USA. 8" overall. 3 7/8" CPM D2 tool steel blade. Antique ivory micarta handles. 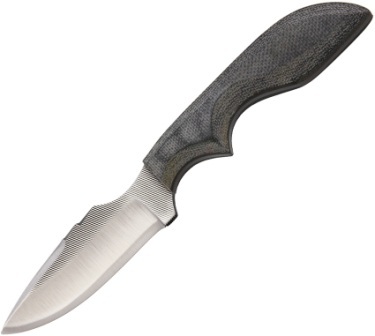 Full tang with extended tang with lanyard loop. Lanyard hole. Brown leather belt sheath. Made in the USA. 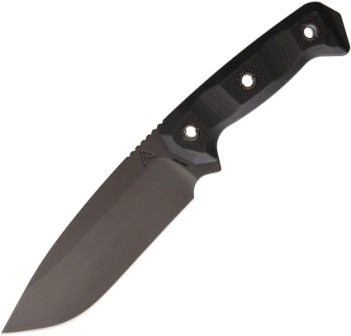 Overall: 8.5"; Blade: 4" | Elmax Steel | Standard Edge; Handle: Black; Other Info: Full Tang | Lanyard Hole. Black canvas micarta handles. Boxed. Made in the USA. Overall: 8.5"; Blade: 4" | Elmax Steel | Standard Edge; Handle: Green; Other Info: Full Tang | Lanyard Hole. Green canvas micarta handles. Boxed. Made in the USA. 9.5" overall. 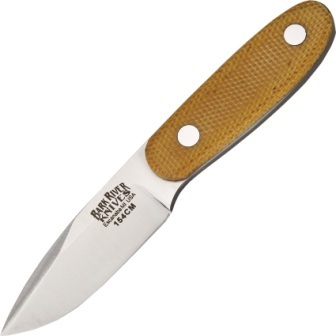 5.25" satin finish A2 tool steel drop point blade. 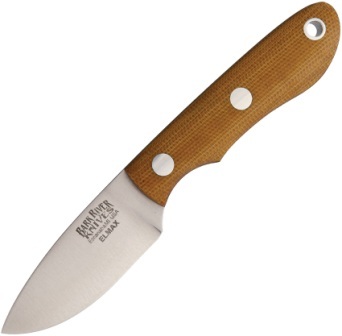 Natural canvas micarta handle. Full tang. Lanyard hole. Brown leather belt sheath. Boxed. Made in the USA. Overall: 8.5"; Blade: 4" | A2 Tool Steel | Standard Edge; Handle: Black | Micarta; Other Info: Full Tang | Lanyard Hole. Canvas handles. Brown leather belt sheath. Boxed. Made in the USA. Overall: 7.5"; Blade: 3.5" | A-2 Tool Steel | Standard Edge | Satin Finish; Handle: Black; Other Info: Lanyard Hole. Nickel silver guard. Black canvas micarta handles. Brown leather belt sheath. Boxed. Made in the USA. Overall: 7.5"; Blade: 3.5" | A-2 Tool Steel | Standard Edge | Satin Finish; Handle: Green; Other Info: Lanyard Hole. Nickel silver guard. Green canvas micarta handles. Brown leather belt sheath. Boxed. Made in the USA. 8.25" overall. 3.625" tool steel blade. 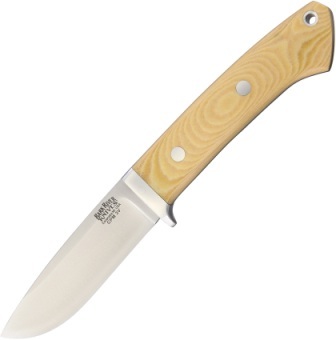 Antique ivory micarta handle. Nickel silver guard. Full tang. Lanyard hole. Brown leather belt sheath. Boxed. Overall: 8.25"; Blade: 3.625" | CPM 3V Tool Steel | Standard Edge; Handle: Black | Micarta; Other Info: Full Tang | Lanyard Hole. Canvas handles with nickel silver guard. Brown leather belt sheath. Boxed. Made in the USA. Overall: 8.25"; Blade: 3.625" | CPM 3V Tool Steel | Standard Edge; Handle: Green | Micarta; Other Info: Full Tang | Lanyard Hole. Canvas handles with nickel silver guard. Brown leather belt sheath. Boxed. Made in the USA. Overall: 7.5"; Blade: 3.25" | Elmax Steel | Standard Edge | Satin Finish; Handle: Black; Other Info: Full Tang | Lanyard Hole. Nickel silver guard. Black canvas micarta handles. Brown leather belt sheath. Boxed. Made in the USA. Overall: 7.5"; Blade: 3.25" | Elmax Steel | Standard Edge | Satin Finish; Handle: Green; Other Info: Full Tang | Lanyard Hole. Nickel silver guard. Green canvas micarta handles. Brown leather belt sheath. Boxed. Made in the USA. Overall: 7.75"; Blade: 3.5" | A-2 Tool Steel | Standard Edge | Satin Finish; Handle: Black; Other Info: Full Tang | Lanyard Hole. Black canvas micarta handles. Brown leather belt sheath. Boxed. Made in the USA. Overall: 7.75"; Blade: 3.5" | A-2 Tool Steel | Standard Edge | Satin Finish; Handle: Green; Other Info: Full Tang | Lanyard Hole. Green canvas micarta handles. Brown leather belt sheath. Boxed. Made in the USA. Overall: 7.5"; Blade: 3.25" | CPM-3V Tool Steel | Standard Edge | Satin Finish; Handle: Green | Micarta; Other Info: Full Tang | Lanyard Hole. Canvas handles. Brown leather belt sheath. Boxed. Made in the USA. 7.5" overall. 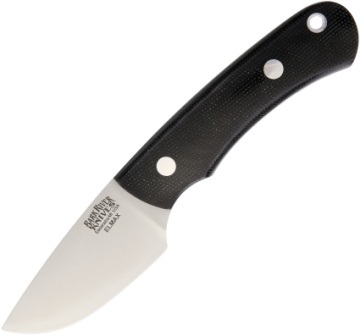 3.25" satin finish CPM-3V carbon steel drop point blade. Natural canvas micarta handle. Full tang. Lanyard hole. Brown leather belt sheath. Boxed. Made in the USA. Overall: 7"; Blade: 2.875" | A-2 Tool Steel | Standard Edge; Handle: Black | Micarta; Other Info: Lanyard Hole | Full Tang. Black canvas handles. Lanyard loop. Brown leather belt sheath. Boxed. Made in the USA. 13" overall. 7.75" satin finish CPM-3V carbon steel blade. Black canvas micarta handle. Full tang. Lanyard hole. Brown leather belt sheath. Boxed. Made in the USA. 13" overall. 7.75" satin finish CPM-3V carbon steel blade. Green canvas micarta handle. Full tang. Lanyard hole. Brown leather belt sheath. Boxed. Made in the USA. 10.13" overall. 5.5" satin finish A2 tool steel drop point blade. Black canvas micarta handle. Full tang. Lanyard hole. Brown leather belt sheath. Boxed. Made in the USA. 10.13" overall. 5.5" satin finish A2 tool steel drop point blade. Maroon canvas micarta handle. Full tang. Lanyard hole. Brown leather belt sheath. Boxed. Made in the USA. 10.13" overall. 5.5" satin finish A2 tool steel drop point blade. Green canvas micarta handle. Full tang. Lanyard hole. Brown leather belt sheath. Boxed. Made in the USA. 10.13" overall. 5.5" satin finish A2 tool steel drop point blade. Natural canvas micarta handle. Full tang. Lanyard hole. Brown leather belt sheath. Boxed. Made in the USA. Overall: 9.25"; Blade: 4.5" | CPM 3V Stainless | Standard Edge | Satin Finish; Handle: Black; Other Info: Full Tang | Lanyard Hole. Black canvas micarta handles. Brown leather belt sheath. Boxed. Made in USA. Overall: 9.25"; Blade: 4.5" | CPM 3V Stainless | Standard Edge | Satin Finish; Handle: Green; Other Info: Full Tang | Lanyard Hole. Green canvas micarta handles. Brown leather belt sheath. Boxed. Made in USA. 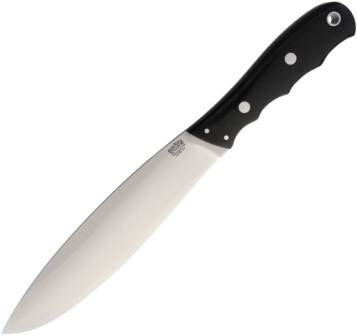 Overall: 9.25"; Blade: 4.5" | CPM 3V Stainless | Standard Edge | Satin Finish; Other Info: Full Tang | Lanyard Hole. Natural canvas micarta handles. Brown leather belt sheath. Boxed. Made in USA. 8.75" overall. 4.25" satin finish CPM-154 stainless drop point blade. Black canvas micarta handle. Full tang. Lanyard hole. Brown leather belt sheath. Boxed. Made in the USA. 8.75" overall. 4.25" satin finish CPM-154 stainless drop point blade. Green canvas micarta handle. Full tang. Lanyard hole. Brown leather belt sheath. Boxed. Made in the USA. 5 1/8" overall. 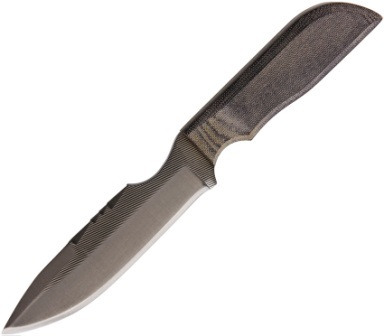 2 1/4" brushed finish CPM-154 stainless blade. Full tang. 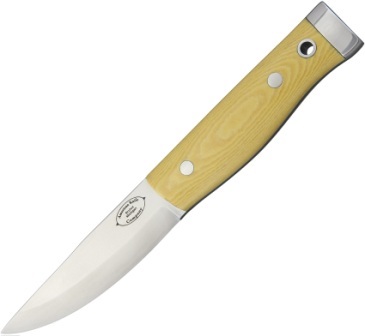 Antique ivory micarta handles with lanyard hole. Brown leather belt sheath. Made in the USA. 5 1/8" overall. 2 1/4" brushed finish CPM-154 stainless blade. Full tang. Black canvas micarta handles with lanyard hole. Brown leather belt sheath. Made in the USA. 5 1/8" overall. 2 1/4" brushed finish CPM-154 stainless blade. Full tang. Green canvas micarta handles with lanyard hole. Brown leather belt sheath. Made in the USA. 6.25" overall. 3" satin finish D2 tool steel drop point blade. Full tang. 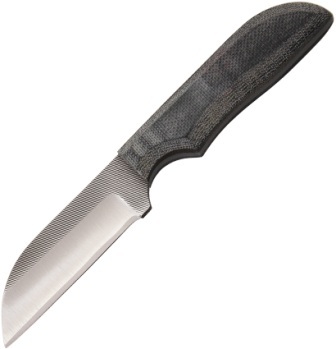 Black canvas micarta handle. Lanyard hole. Brown leather belt sheath. Boxed. Made in the USA. 6.25" overall. 3" satin finish D2 tool steel drop point blade. Green micarta handle. Full tang. Lanyard hole. Brown leather belt sheath. Boxed. Made in the USA. Overall: 7.75"; Blade: 3.75" | CPM-3V Steel | Standard Edge; Handle: Black; Other Info: Full Tang | Lanyard Hole. Canvas micarta handles. Brown leather belt sheath. Boxed. Made in the USA. Overall: 7.75"; Blade: 3.75" | CPM-3V Steel | Standard Edge; Handle: Green; Other Info: Full Tang | Lanyard Hole. Canvas micarta handles. Brown leather belt sheath. Boxed. Made in the USA. Overall: 6"; Blade: 2.5" | Elmax Steel | Standard Edge | Satin Finish; Handle: Black; Other Info: Full Tang | Lanyard Hole. Black canvas micarta handles. Brown leather belt sheath. Boxed. Made in the USA. Overall: 6"; Blade: 2.5" | Elmax Steel | Standard Edge | Satin Finish; Handle: Green; Other Info: Full Tang | Lanyard Hole. Green canvas micarta handles. Brown leather belt sheath. Boxed. Made in the USA. Overall: 9.5"; Blade: 4.625" | A-2 Tool Steel | Standard Edge | Satin Finish; Handle: Black; Other Info: Lanyard Hole | Full Tang. Canvas micarta handles. Brown leather belt sheath. Boxed. Made in the USA. Overall: 9.5"; Blade: 4.625" | A-2 Tool Steel | Standard Edge | Satin Finish; Handle: Green; Other Info: Full Tang | Lanyard Hole. Canvas micarta handles. Brown leather belt sheath. Boxed. Made in the USA. 8 5/8" overall. 4" A-2 tool steel blade. Full tang. Black canvas micarta handles. Lanyard hole. Brown leather belt sheath. Made in the USA. 8 5/8" overall. 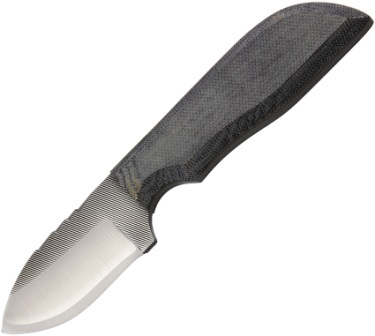 4" A-2 tool steel blade. Full tang. Green canvas micarta handles. Lanyard hole. Brown leather belt sheath. Made in the USA. 8 5/8" overall. 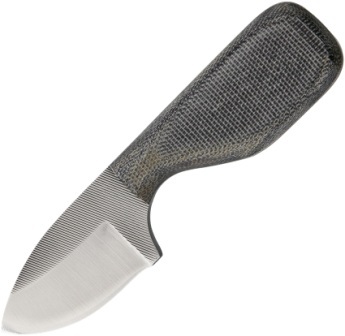 4" A-2 tool steel blade. Full tang. Natural canvas micarta handles. Lanyard hole. Brown leather belt sheath. Made in the USA. Overall: 9.25"; Blade: 4.5" | CPM-3V Steel | Standard Edge; Handle: Black | Micarta; Other Info: Lanyard Hole | Full Tang. Canvas handles. Brown leather belt sheath with internal retention magnet. Manufacturer's Warning: Caution: Do NOT wear with pacemaker. Boxed. Made in the USA. Overall: 9.25"; Blade: 4.5" | Carbon Steel | Standard Edge; Handle: Green | Micarta; Other Info: Full Tang | Lanyard Hole. Canvas handles. Brown leather belt sheath with internal retention magnet. Manufacturer's Warning: Caution: Do NOT wear with pacemaker. Boxed. Made in the USA. 6.25" overall. 2.75" satin finish CPM-154 stainless drop point blade. Black canvas micarta handle. Full tang. Lanyard hole. Manufacturer's Warning: Sheath contains magnets. Do not wear with pacemaker. Brown leather belt sheath. Boxed. Made in the USA. 6.25" overall. 2.75" satin finish CPM-154 stainless drop point blade. Green canvas micarta handle. Full tang. Lanyard hole. Brown leather belt sheath. Boxed. Made in the USA. 6.25" overall. 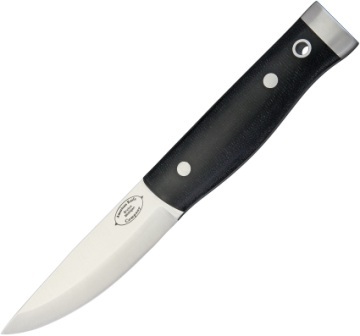 2.75" satin finish CPM-154 stainless drop point blade. 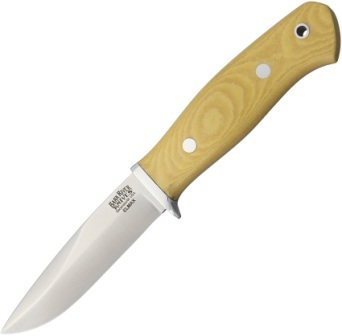 Natural canvas micarta handle. Full tang. Lanyard hole. Brown leather belt sheath. Boxed. Made in the USA.